Sometimes things just seem to lucky to be random chance but are they? Everyone knows that humans were in the New World long before Columbus arrived but no one knows exactly how they got there. On foot, in boats, across the Pacific or the Atlantic ocean? Is there only one option or could all the players be right? In December 1910 Dorothy Arnold, a wealthy New York socialite, left her family’s Manhattan home to go shopping, and never returned. Despite a massive search and extensive investigations, no trace of her was ever found. Since the early 1980’s, linoleum tiles have been found embedded in asphalt all around the world. They bear the inscription “TOYNBEE IDEA, IN MOViE `2001,RESURRECT DEAD, ON PLANET JUPITER”. Their origins are unknown. A new arcade game arrived in Portland Oregon in 1981 but was pulled from arcades just weeks after it arrived. It’s never been seen again. Was it having strange effects on the kids who play it? Was it a government test? Is it just an urban legend? 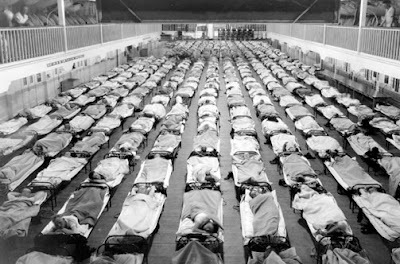 The 1918 flu pandemic, known as the Spanish Flu, killed 50-100 million people world wide, somewhere between 3%-5% of the worlds population at the time. What made this flu strain so deadly, how did it spread so fast, and where did this strain come from? In this extended show we dive deep into the possible origins, behaviors, and potential causes of this flu pandemic.